When I first tried a GOSH Velvet Touch Liner, I was genuinely amazed at how they performed. They just work. They’re creamy and smooth to apply. Once applied they don’t budge from the waterline on me for around 6 hours and if applied along the lower lashline, they don’t move until I remove my makeup that evening. They come in an amazing array of colours and each pencil will set you back around a fiver. I realised a few weeks ago, that since buying these I hadn’t reached for any of my other pencils (and eyeliner is kinda my ‘thing’, so I had a few!). I ended up giving away, selling or binning my eyeliner stash and am now on the wonderful mission of hunting these down in every shade available. 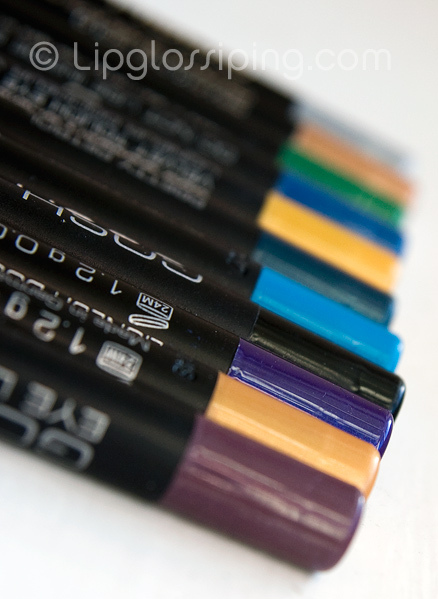 GOSH Velvet Touch Eye Liners are priced at £5 each and are available from Superdrug (instore & online). Don’t forget, there’s a Superdrug 3for2 promotion going on at the moment aswell! I have the lightish blue one and I didn’t think it was that good. I didn’t think it showed up that much on my waterline but after hearing you rave I might try again, I think I used it once then stashed it in the back of the collection. I’ll have another go! I did a make up purge in January this year when I couldn’t close my make up box any more, and there really was a lot of rubbish in there. Oh, how I love these GOSH eyeliners! I was actually thinking of writing about them but just never got round to it. I haven’t got as many as you do but I sure would like to buy more of them. They work great! Have you got Antique Brass? If you haven’t got that, you need it. I get a lot of requests for these pencils in my US care packages/cultural exchanges. Ah, 3 for 2. One of the most beautiful phrases in the English language. I bought the black one a few days ago and found it disappeared on me within an hour and a half, I’ll give it another couple of goes though. My waterline just doesn’t like eyeliner, lol. Ive only got one and never really got round to using it as its Blue. I was going through a phase ha. i have 22 of the eyeliners i got blueberry ice and green boost, and i love them!! It literally hurts me to throw makeup away so I haven’t purged for a while. However, a lot of my makeup goes to my cousins. When my mum goes to India she takes the stuff that I haven’t used. I don’t give them crap that I’m going to chuck, they have really nice makeup that I’ve bought and haven’t been able to use. I NEED to purge my lipgloss collection as it’s looking massive compared to my collection of other makeup. The problem is that I do use all my glosses but because I use them all at the same time, one never seems to finish! makeup purge? My best friends [my housemates] take all the stuff i dont use. haha. they think its justified…i can’t blame them really. gosh! 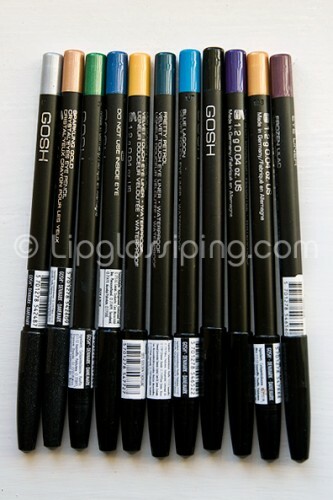 hehe The GOSH liners look great, but i can never bring myself to buy colour liners, i always just revert to classic black. but saying that, I have been eyeing the gold one in urban decay’s 24.7 super stash though…. I want to find out if they sell these in the states! I love colored eyeliners when I go out at night or when I get bored of black – I have been wanting the MUFE colored eyeliners for awhile now, but they are too pricey for me. PURGE?? you must be nuts.. but i do love these! V..pigmented and last longer (meaning you sharpen less often) than the 24/7 UD ones!